You are probably thinking to yourself, what is this guy thinking? Here he is, month after month, waxing poetically about the subtle nuances of the finest beers of the world, and now he is going to throw mixers into them? That is exactly what I am about to tell you to do. The same thing is done with the finest bourbons, vodkas, gins and even wines, so why not beer? The following are some common and not-so-common cocktails. Feel free to try them and the many others that you will see on drink menus in your travels. You will not be disappointed. Cheers! A shandy is pretty much a blanket term for beer mixed with a soft drink at more or less a 50/50 mixture. There are many different varieties. A panache is a draught beer mixed 50/50 with carbonated lemonade in France and Switzerland, sometimes with grenadine. A diesel is draught beer mixed with Coca-Cola. A lager top in England is a draught beer with a splash of lemonade. In Australia, they mix stout with lemonade at a 50/50 mixture and call it a portergaff. There are many more varieties, so many that I could do a whole article just on shandies. Be sure to read the description before ordering, as they are all not lemon-based. I have yet to come across something that does not mix well with Guinness. First of all, everything looks visually appealing, as the nitrogen-carbonated Guinness causes it to rise above the normally carbonated companion in the glass, creating a visual spectacle. In the beginning, there was the black and tan, which is a mixture of Guinness and Bass Ale. I have also had a black and blue, which substitutes in Wachusett Blueberry Ale. Guinness with a hard cider goes by many different names, as does Guinness with champagne, Smithwicks, Newcastle, Blue Moon, Harp Lager, various craft beer (including IPAs) and even a shandy. I found a Pabst Smear, half Guinness and half Pabst Blue Ribbon, to be oddly satisfying during the most recent St. Patrick’s Day Parade. This is something that I had while on vacation in Maine. I am a big fan of the real watermelon flavor that you get from Hell or High Watermelon, a fruited wheat beer from 21st Amendment, but this creation takes watermelon beer to a whole different level. Begin with a pint glass. Add to it 4 ounces of chilled watermelon juice with the seeds and pulp removed. Add a teaspoon of simple syrup and stir until combined. Next, fill the glass the rest of the way with Allagash White or the wit or white of your preference. The citrus from the beer mingling with the sweetness of the watermelon is a certain crowd-pleaser, even for those that claim to not like beer. I did not expect this to be good. I expected there to be Michelob beer, but there was not. Who buys Clamato juice? I thought it was to make Manhattan clam chowder until now. I had this over a friend’s house last summer and recently went back to get the recipe. Begin with a pint glass. Rub the rim with a quartered lime, then salt the rim. Fill the glass about 1/3 full with Clamato juice (or regular tomato juice if the idea of clam juice does not work for you). Add two shakes of your favorite hot sauce, then add two shakes of maggi sauce (soy sauce also works.). Juice the rest of the quarter lime slice into the glass. 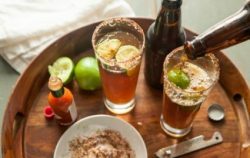 Stir together for five seconds, then fill the rest of the way with your favorite lager, one from Mexico if you wish to be authentic. A Berliner weisse is a sour wheat beer that originated in Germany. It is typically low in alcohol, typically around 3 percent. What it lacks in alcohol, it makes up for in its lactic acid-puckering sourness. Some people like it as it is; some like it with an added fruity sweetness. Typically this beer is either served as is or “mit schuss” (German for with a shot of sweet syrup). The bartender will either add the shot of syrup directly to the beer or serve it on the side. In Germany, the usual choices are either “ein rotes” which means “a red one,” which will get you raspberry syrup, or “ein grunes,” which means “a green one,” which will get you woodruff syrup. Right now, you are wondering what woodruff tastes like. It has a touch of vanilla and some anise; overall, it’s a little like an herbal cough drop. It’s an acquired taste for sure. Night Shift Brewing in Everett brews some outstanding Berliner weisse, with various fruits already brewed into the beer, but since this is a beer cocktail article, The Tap in Haverhill brews a top notch Berliner Weisse called Intergalactic Acid. It is available locally, and it is the one I purchase myself to pair with a syrup. Speaking of syrups, do not feel like you have to limit yourself to just raspberry or woodruff. Experiment. Local in-season berries muddled into a simple syrup go quite well with unflavored Berliner weisse.